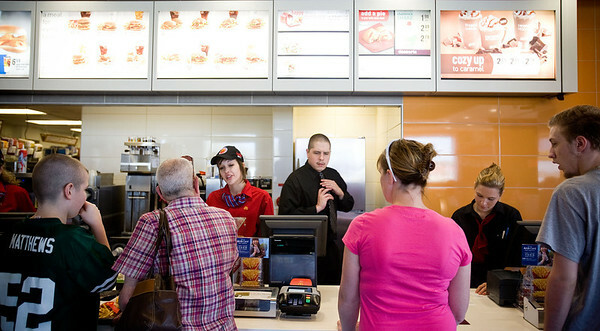 Jenny Kane - jkane@shawmedia.com McDonald's employees Amanda Tonyan, (left) Chris Martin, (center) and Jennifer Popejoy, (right) take orders during the lunch rush. It was McDonald's Grand opening at their new location on S. Route 31 in McHenry. Jenny Kane - jkane@shawmedia.com Family friend Penny Orlowski asks Erin Gitchell, 3, which happy meal toy she still needs to get during the lunch rush. It was McDonald's Grand opening at their new location on S. Route 31 in McHenry. Jenny Kane - jkane@shawmedia.com McDonald's shift managers Chris Martin, (left) and Jennifer Popejoy, (right) finish taking an order during the lunch rush. It was McDonald's Grand opening at their new location on S. Route 31 in McHenry. Jenny Kane - jkane@shawmedia.com McDonald's crew member Dylan Woods takes down balloon from the lobby. It was McDonald's Grand opening at their new location on S. Route 31 in McHenry. McDonald's crew member Dylan Woods takes down balloon from the lobby. It was McDonald's Grand opening at their new location on S. Route 31 in McHenry.